Vintage Royal Copley rooster wall pocket vase. 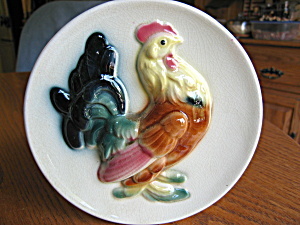 Great old wall pocket with raised Royal Copley mark on back; front features a glossy multi colored rooster. No chips or cracks; just crazing, and is 6.75 tall x 6.75 wide x 2 deep. Shown in the RC book but the book prices are very outdated. It looks better than the pictures are showing it. A hard to find item! RC and Royal Windsor were a part of the Spaulding China Co.